There it sits. The blank page staring at you. Now what?? In high school history class you could fill a full page with complete abandon. When you were five, you joyously drew your stick family with flowers and rainbows and dogs and trees and, and, and… So what happened? The thing is, when I went to doodle as an adult, I had forgotten how. How to let go of everything weighing on my mind, of everything I needed to do, of everything that demanded my attention… In a word, simply everything was blocking the freedom of my hand to just move in any which direction, to fluidly and systematically flow, to be ONLY in the here and now. So, I picked a point to start. When you are faced with a problem, isn’t that what you do? Pick the easiest place to start? I drew a shape or a word or anything that came to my mind that felt good or right. The lines didn’t need to be straight nor the circles perfectly round… because, well, nothing in life is perfect now is it? We learn to adjust. And then I repeated a stroke, over and over and over in a regular pattern with in the boundary of the shape. I found that that boundary or border became quite comforting to me because it helped to define my work and my direction. Sometimes i just started in the corner and worked my way out. It was actually quite intense and liberating at the same time. I would quickly fill the shape and then start again until the new space was also filled. Once complete, I sat back and was amazed at what I had done. I do not draw and yet I managed to transform a blank page with ink alone into something really cool. It was gratifying. Now, I would love for you to think that these doodle patterns came directly out of my head, but I would be remiss in not sharing some of their inspiration. You see, I actually did google how to doodle. I love the process of learning and the internet is the giant set of encyclopedias that we referenced all the time as children. It is knowledge there for the taking, if only you ask the question. So, when I started to doodle and had no idea where to start, I googled it. What I discovered was a whole art form! Who knew?! It was a virtual treasure trove of artistic beginnings. They showed you the strokes, you just need to execute in your own style. Awesome! In order to get started, you need a piece of paper, starting smaller is easier- think 4 inch x 4 inch and a nice fine tip pen. I used a fine sharpie pen and a Precise fine roller pen. Micron pens are highly recommended for the most precise creations. Using a pencil outlined shape to start makes it easy to stay within your boundaries or to abandon them all together. 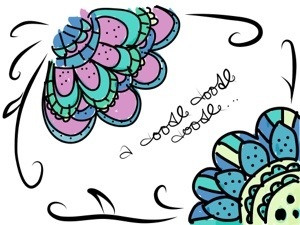 If you are a technology inspired creator, check out Adobe ideas and Bamboo Paper for technologically enhanced doodling. I liked the free cost of Bamboo Paper when I got started and it has nice options in color and writing implements. I found Adobe Ideas gave me a little more precision. With the use of layers, I could simply slide my details layer back on top of my color layer to hide a multitude of coloring mistakes and preserve the integrity of my details. You are also able to select from a full color palette and select the exact size you would like your stroke to be. Coloring in both apps is a tad tricky since release of a stroke causes the next stroke to cover it, just like with a Crayola marker. And if you don’t think your kids are watching… take a look at what my little man created while I was doodling. He had asked for a pen and paper so I obliged. 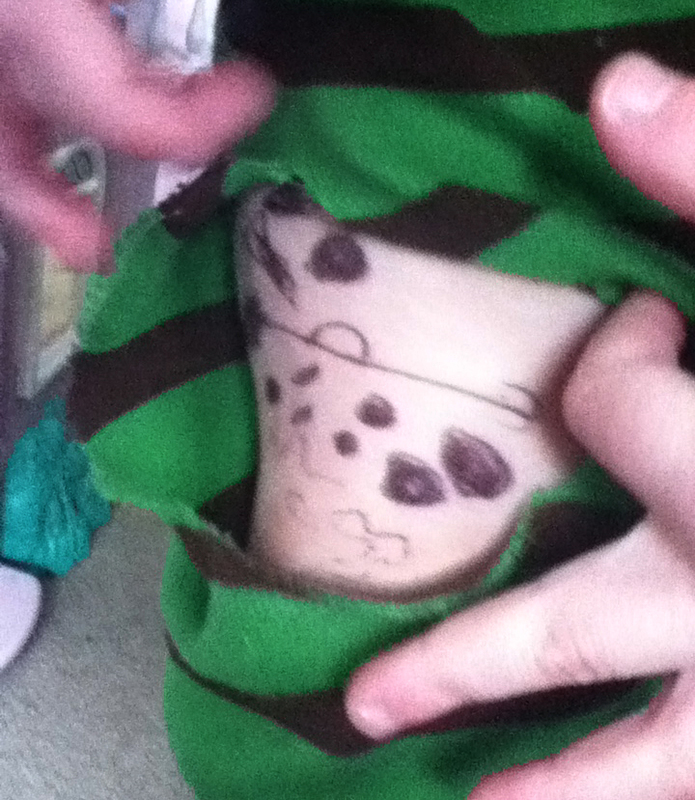 Not quite what I had in mind, but hey, at least he didn’t use a sharpie and he did he get his doodle on! Thanks for reading and happy creating!! !